The Norfolk Community College Project is part of the Building Better Opportunities programme, which has received funding from the National Lottery, through the National Lottery Community Fund and the European Social Fund to supports long term unemployed people facing complex and multiple barriers across Norfolk. 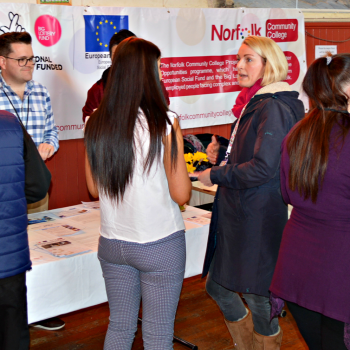 Norfolk Community College provides a range of services and advice to people seeking jobs and new skills. Are you looking for a job, or to improve your skills? Then Norfolk Community College is the place to explore. We are here to provide training, work placements, advice and volunteering opportunities to help you achieve your next goal in life. Our support and services are available across Norfolk. That means you will see us in a range of venues such as community centres and libraries in Breckland, Broadland, Great Yarmouth, King’s Lynn and West Norfolk, North Norfolk, Norwich, and South Norfolk. We work with a network of trainers, community groups and charities to match help to suit people’s needs. To find out more click on the links below and visit our About, Partners and Contact pages. We understand that meeting new people, starting a training course or going for a job interview can be daunting. That is why the Community College offers a range of activities to help you build your confidence, and at a pace that is right for you. Whether you want to be a bricklayer or a teacher, a nurse or an engineer, the Community College will do everything it can to match you to the right training course. Most importantly, we will work with you to identify and grow the skills you already have. Getting a job is easier when you have experience. That is why the Community College has joined-up with local employers to offer you a range of work placement opportunities. We can also advise you on starting up your own business or charity. Hi, my name is Ryan. 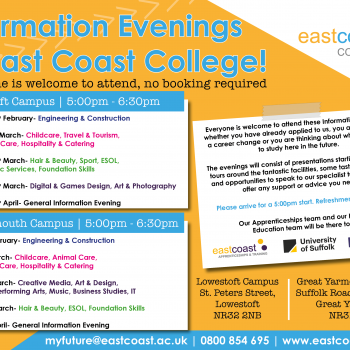 I was 17 and left East Norfolk Sixth Form College due to feeling like the courses were not for me and I needed to do something different. I came to Great Yarmouth College (now East Coast College) and started a Traineeship which enabled me to gain a work placement at the college in the Marketing team.